I regret to inform you that time machines and Ponce de Leon's fountain of youth do not exist despite what Olay would have you believe. I can't believe you looked for the fountain of youth in FLORIDA. The land of skin cancer, bath salts, alligators and Gatorade is trying to KILL you; NOT keep you alive forever. If Dexter taught us anything it's that Florida wants you dead! Sorry, but somebody had to send a letter to that guy. 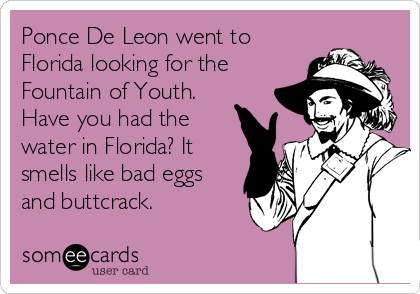 Ok, for everyone else who is NOT Ponce de Leon, I just want to let you know that wrinkle creams don't work. 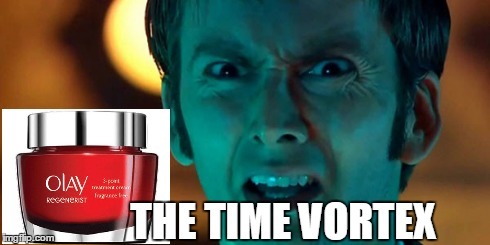 But don't listen to me, listen to the doctors. Unfortunately, dermatologists have been in my life since birth. I have suffered from eczema since the womb. So, sometimes I ask my dermos silly questions out of boredom and I want to break up the monotony. Every skin doc from Texas to Italy has told me the same thing, "There is NO science to prove that anti-aging creams work no matter how expensive they are or where they come from." These lotions are a modern day snake oil scam. If you truly want to look younger or prevent aging then I would suggest saving your money and investing in time travel technology because that would be a better use of your $29.95 than spending that same cash at Wal-Greens on a tub of mystery cream....gross...mystery cream, ewwwwwwww. Nothing that is packaged in a tub can turn the hands of time backwards.